Which movie's right for you this weekend? White House Down? The Heat? Fandango Chief Correspondent Dave Karger breaks them down. Which movie's right for you this weekend? The Heat? White House Down? Fandango Chief Correspondent Dave Karger breaks them down with a little help from Melissa McCarthy and Sandra Bullock. Looking for movie tickets? 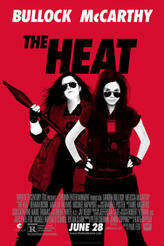 Enter your location to see which movie theaters are playing The Heat (2013) near you.